2 by 3 Heroes: The end of an era. What do they say? "Life ebbs and flows like the waters of the ocean"? "The meaning of life is that it stops"? "It is not the length of life; it is the depth of life"? "Between birth and death, life happens in the blink of an eye"? Life is like a box of chinchillas. Or something like that - I forget what Momma said. 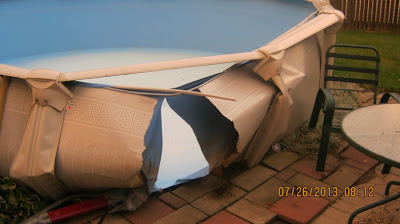 That would be what is left of our pool. Best guess: there was some major wind activity the night before that tossed around the patio furniture. I picked it up, but it must have weakened it enough as it burst about 18 hours later. 30k+ of water rushed out. Bet it looked AWESOME! But that pool has been up for a good 12 years. However, the only one that still used it much was my wife (and the dog). The kids are all grown and don't swim anymore. On the positive side, home owners covered the replacement of it, so win win! 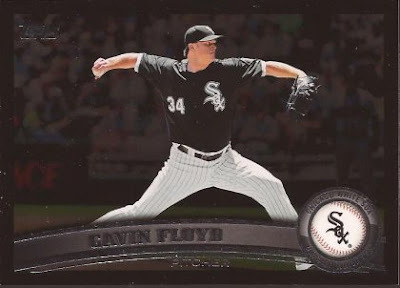 Anyway, I need to get this post back to cards, so how about a quick posting of a PWE I received from Roy at Plain Gray Swatch. He joined up with Club PWE. Roy was kind enough to send something back, though I certainly do not expect it. If you join Club PWE, I will send you stuff and you never have to send me anything back. If you want to - awesome. You're sweet. Like my favorite ribbon candy, honey. And more. Topps really should have put this with a complete home uniform instead of the alts. Anyway, thanks Roy. And goodbye, Jacuzzi brand pool. I will never forget your coolness, your waves, your noodle fights, and your hard to manage pH levels. Love the Breeders. Saw them once in like 2002, then again in like 2012 or thereabouts. Fun shows both. Catching up before I head out. Topps - not even trying anymore.